Sad news today from Kentucky’s Mammoth Cave National Park, where Superintendent Sarah Craighead confirmed the death of a northern long-eared bat from white-nose syndrome, a deadly infection that affects bats that hibernate in colonies. It is named for the frosty white fungal growths that appear on the muzzles of sick bats. Bat with white-nose syndrome. USFWS. The disease is caused by a fungus, Geomyces destructans. Since it was first detected in 2006 in Schoharie County, New York, the fungus has spread to 21 states. Bat Conservation International estimates that more than 5.7 million bats have died. Mortality rates in some caves have approached 100%. 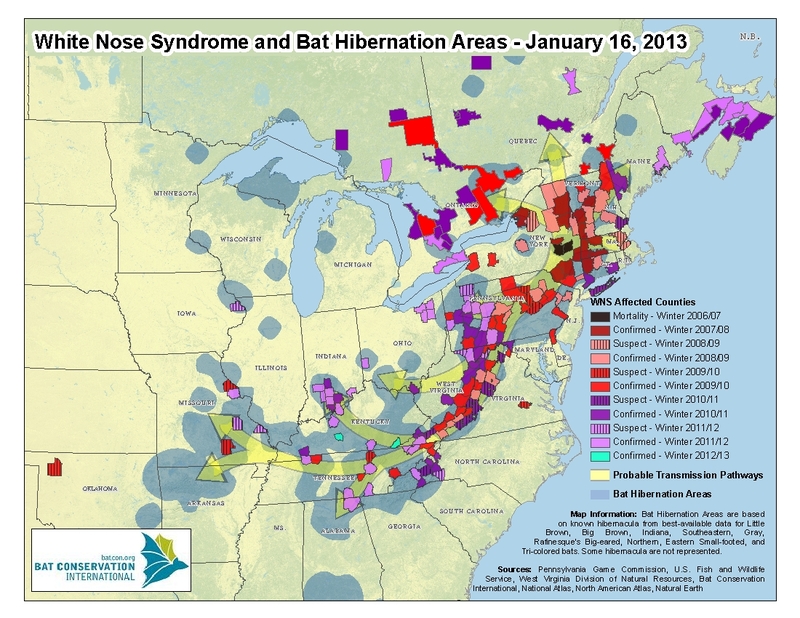 Map from Bat Conservation International illustrating the spread of white-nose syndrome over the past seven years. Why is white-nose so deadly? Put simply, it causes hibernating bats to wake up. Their metabolic rates kick up to normal rates. Since insect-eating bats can’t find food during the cold months, they have no way to replenish their fat stores when this happens. They burn through their fat reserves too quickly and are unable to make it to spring. For an example, let’s take a closer look at the endangered Indiana bat (Myotis sodalis). Medium-sized, as North American bats go, a full-grown Indiana bat weighs in between six and nine grams. That’s the equivalent of about three pennies. A healthy Indiana bat in hibernation. USFWS/Ann Froschauer. The U.S. Fish & Wildlife Service estimates that, as of 2009, the total Indiana bat population was around 387,000. That’s about half what it was when the little insectivores were first listed as endangered, back in 1967, and I’m sure it has fallen still more over the past three years. 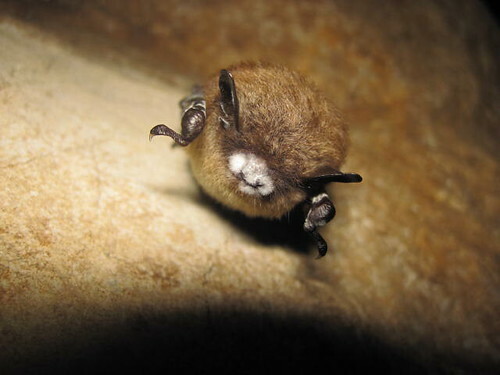 Already in trouble because of habitat loss, Indiana bats now face additional threats from white-nose syndrome because they hibernate in only a few limestone caves. Vast numbers of bats congregate for the winter at these hibernacula, which must meet very specific criteria: they need to have steady temperatures of 39-46°F throughout the winter. To give some sense of how particular Indiana bats are, there are 4,700 known caves in Missouri, and only 24 of them are used as hibernacula. Or, perhaps more significantly, about 85% of the known Indiana bat population hibernates in only seven caves. 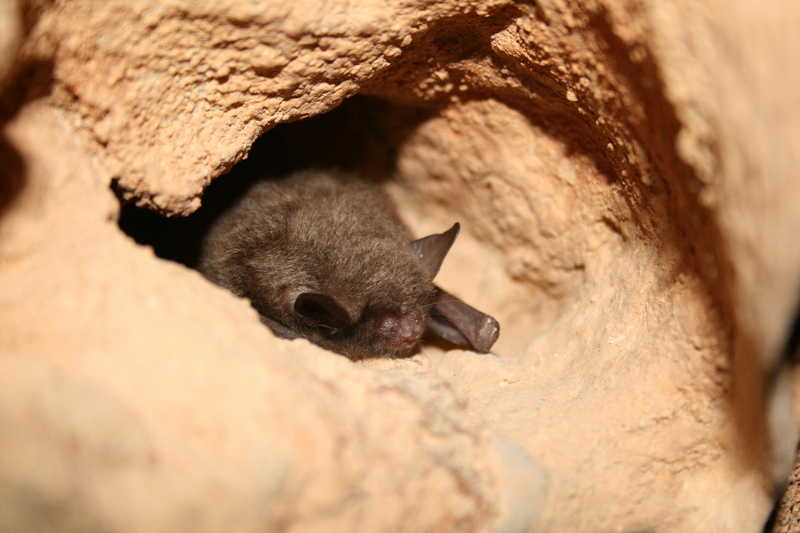 A good, chilly hibernation cave allows the bats to slow their metabolic rates way down. The bats can live for six months without food, getting the calories that they need by burning their fat stores. The few suitable caves may house tens of thousands of bats, which snuggle up to each other in clusters that average 500-1,000 bats packed into an area of just a few square feet. 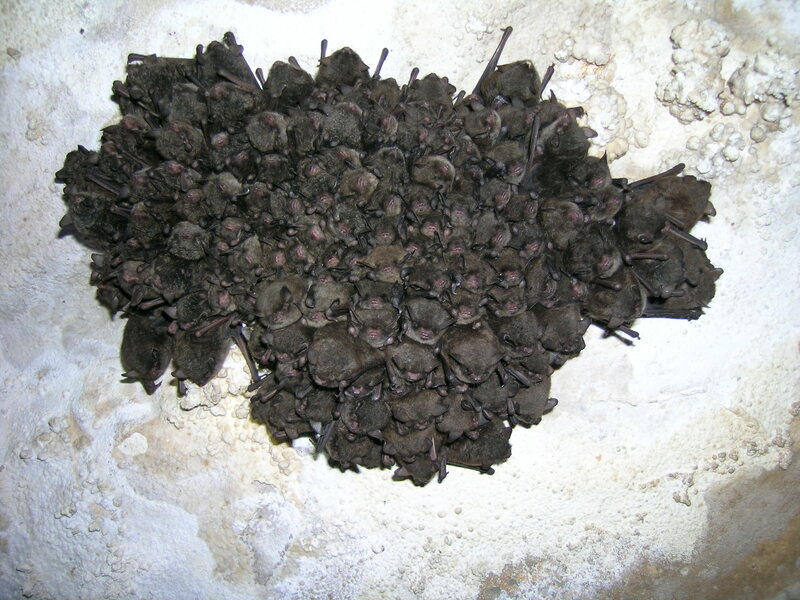 Indiana bats huddle together while hibernating hanging from the ceiling of a cave. Photo by Steve Thomas, via NPS. Not all bats are affected. The nine species that are are all colonial hibernators. The fungus spreads through spores, often directly transmitted from one bat to another. However, people can also unknowingly transport the fungus from one place to another in clothing, shoes, or caving gear. Closing caves to visitation has been an unpopular move, but it may help slow the spread of the deadly fungus. Want to help protect our bat populations? My favorite source for information and bat-saving ideas is Bat Conservation International, a nonprofit that advocates on behalf of our furry flying friends. You can also learn about ways to fight white-nose syndrome and protect bats at WhiteNoseSyndrome.org. That is very sad news. Hopefully the outbreak in Mammoth Cave won’t be as bad as others. I certainly hope so, too, but I’m afraid I’m not optimistic on this one. White-nose has just been so devastating. One thing we can do to help, though, is try to remove some of the habitat-loss pressure these species are facing. Indiana bats, for example, need older trees with craggy bark for maternity roosts in the spring and summer months. Shagbark hickories are ideal. Protecting old shagbarks (and planting more, for the long-term benefit of bats) is a good move. Installing bat houses is, too. Bat Conservation and Management, Inc. is a private wildlife consultant that works with landowners to plant shagbark hickories and take other assertive approaches to bat conservation. These things may not stop white-nose, but they can at least relieve some of the pressure our bats are feeling from other directions. This is tragic…. I belong to the group you mention, as well as “Save Our Bats,” another great organization. It’s baffling that they can’t resolve this; it’s beyond heartbreaking. We NEED OUR BATS. And if they must close the caves, to slow down / cease the spread of the fungus… Then do so, for pete’s sake!! They’ve been dealing with this issue for so long — here and elsewhere — and they can’t find a solution? I’ve read so many heartbreaking stories, of people running around the forest floors in other countries, scooping up these amazing creatures in the hopes of saving them…. Are scientists actually working towards a cure? I agree that we need to be a lot more aggressive in protecting our bats, both by preventively closing caves to slow the spread of the fungus and by funding research into finding a way to defeat it. But since I’m not a bat biologist, I don’t really know, in a concrete sort of way, what they’re doing to fight the disease. You’ve inspired me to get in touch with BCI and ask. I’ll report back if I find anything out.